Halloween was quite successful here this year. 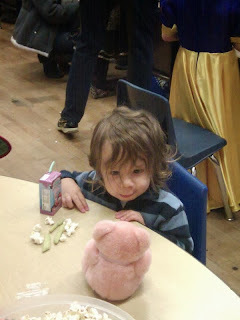 We, once again, didn't get honey popcorn made, but we did manage to carve one pumpkin (we still have one waiting to be carved) and I got costumes done in time for both boys, I was able to "help" (mostly I just chased Malcolm around) at Gareth's school Halloween party and we took both boys out trick-or-treating. 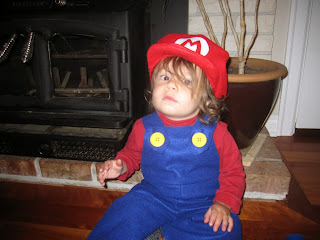 Gareth was interested in a Mario costume last year, but I didn't want to buy something that I could so easily make myself, so I suggested we do Mario this year instead. 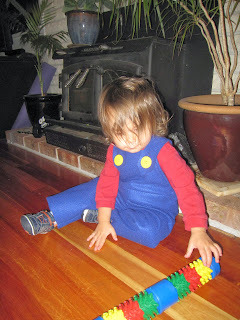 I found a simple pattern for the overalls here and an equally simple pattern for the hat here. Had a couple stressful days when I thought the hat pattern was way too small. But it turned out that it had simply printed as though it was a 4x6 picture rather than a full page. Once Ryan re-printed the pattern the right size they went together super quickly. Knowing Malcolm wouldn't tolerate a mustache or gloves (heck, he wouldn't even keep the hat on), we opted to dub him "baby Mario" and Gareth was big Mario. 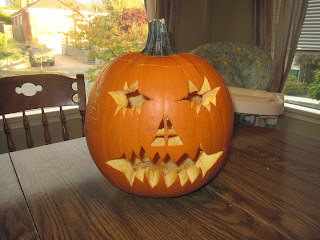 The pumpkin is, as usual, of Gareth's design. Maybe in a year or two we'll let him start helping with the actual carving. He did quite well as scooping out the goop this year, and then he removed the seeds from the goop while Ryan and I carved. Once he tired of seed removal he had fun stabbing the portions of the pumpkin we'd already cut away. Gareth's class held their party at the end of the day, so I was actually able to attend. 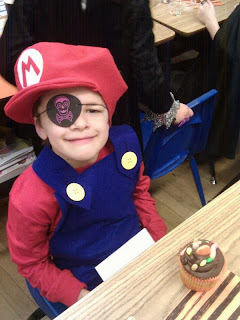 They played some games, had huge cupcakes with a ridiculous amount of frosting on them (which they proceeded to decorate further with candy) and got to show off their costumes to their class. Gareth had a good time, as did Malcolm. Malcolm loves the stuffed animals in the classroom, particularly this pink bear. I think it's a bear. Maybe it's a pig. Whatever it is, it's usually the first one he goes for every time. Juicebox heaven. First time having a juicebox and popcorn. He was a very happy camper. We only let Malcolm do a few houses before bringing him back home. He mostly enjoyed being allowed to run free along the sidewalk. He did go up to a couple of houses and melted the hearts of one couple when, after they gave him some candy, he tried to hand them a Twix bar still in his hand from the previous house. He was in a very happy mood on the way home. Gareth, with his haul. You can't tell very well, but I cut the scalloped shape in the mustache. 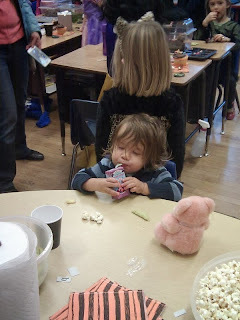 It was a bit wide, so he ended up with some fuzzy stuff in his mouth, but he survived. 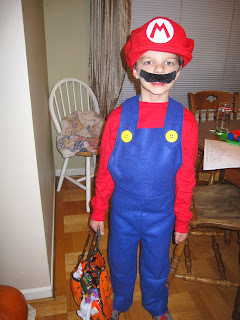 He got several pounds of candy, I'm sure (we haven't weighed it, but it fills our largest mixing bowl). Gareth enjoyed running around with his gang of friends and declared it the "best Halloween ever!" before going to bed.